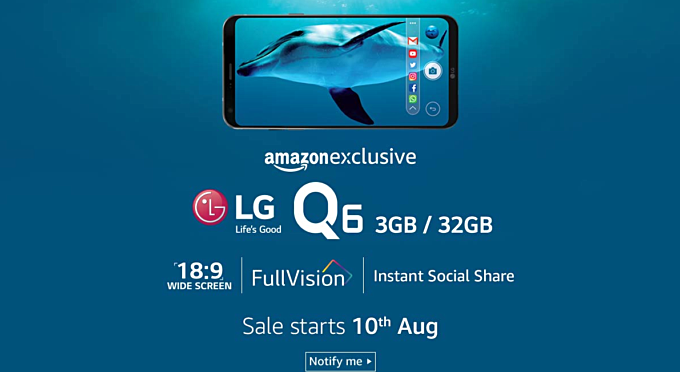 The LG Q6 will be getting its first international launch in India on August 10 as an Amazon exclusive after launching in South Korea earlier this month. Indian customers can soon get their hands on the new LG Q6: a mid-range smartphone with essential premium features, as soon as August 10. The handset will be available exclusively on Amazon.in. LG first launched the handset on its home turf, South Korea, on August 2 at a retail price of KRW 419,100 (US$ 375). Pricing of the Indian variant is not yet known but could retail close to South Korean prices. The LG Q6 is a watered down version of the LG G6 and comes with mid-range specs. Similar to the G6, the body of the Q6 is forged out of 7000-series aluminium and comes in Astro Black, Ice Platinum and Terra Gold colors. The phone features a 5.5-inch 18:9 FHD+ FullVision display with a native resolution of 2160x1080 and is powered by a Qualcomm Snapdragon 435 SoC. The rear shooter is a 13 MP sensor while the front camera is a 100 degree wide angle 5 MP camera. The phone features the same facial recognition capabilities as the G6. There is 32 GB of internal storage (expandable via micro SD) and 3 GB of RAM to power through most tasks. Other features like WiFi 802.11n (no 5 GHz band) and Bluetooth 4.2 come standard. Android 7.1.1 Nougat is available out-of-the-box. The LG Q6 will soon launch in other international markets such as Germany and the rest of Europe later this month, followed by Latin America and North America.